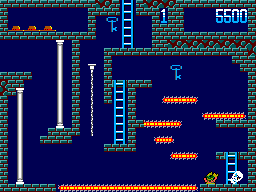 Here, Panama Joe (in green) is climbing down a ladder after avoiding a spider. This game, I find interesting, since it’s just on the edge of “not an Action RPG for me.” The game does have puzzle elements. You collect keys to open doors, and there’s a strategic element to where and when you use those keys. You can also use certain items to kill enemies. This can have a strategic element, since you can dodge some enemies to save your items for a later one. This fits fairly close to my opinion that an action RPG should involve a strategic or puzzle like element. This set of jumps involve 5 conveyor belts which run in different directions. 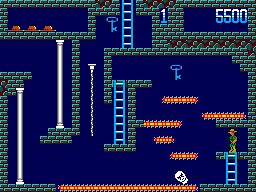 Platforming is a major element in the game. Due to the age of the game, and the system, it’s pretty awkward. It frequently feels like platforms aren’t exactly where they seem to be (a good example is jumping onto a thin conveyor belt.) There is a strategic element to picking a good path through a room. However, since the controls are iffy, it feels like it’s unfairly difficult. There is usually spots to stop and rest and look around the room. Unfortunately, the bad controls are combined with another old school element. You cannot fall more than a certain distance without dying. This means that the game feels a lot more like you’re working on timing your jumps / handling than the controls, versus a puzzle element of exploring. The speed at which you can die does not help. The drop down from the platform with the ladder is fatal. Another problem is the enemies. Action RPGs often offer no way to fight, or puzzle like ways to fight enemies. If you do have a lot of fighting, you often have upgrading equipment, or a strategic element to timing attacks. 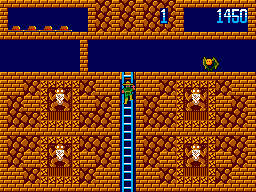 In this game, you do have strategic timing to picking when to deal with an enemy, or avoiding the enemy. However, this falls a lot more into a “timing puzzle” for me – basically making the game fit more into the action genre. The first room in the game has some plot. The variety of backgrounds, and the room layouts are pretty interesting. I could see the game being a pretty fun action RPG romp – but it’s just on the edge of too actiony for my taste. Comparing this to Lutter, the game doesn’t have upgrade elements, and there’s not a lot of item usage. 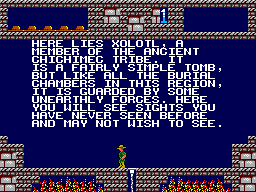 Instead, Montezuma’s Revenge pretty much knows what you have, and assumes you’ll use it on one to two options. In Zelda, even the early games, you have a lot more options for avoiding / fighting enemies. You also are a much more sturdy character. This is news to me. I would expect fighting to be pretty significant in something defined as an “action-X.” What exactly is an action RPG, then? Well, I’m thinking more of the games that remove your ability to fight in certain areas? So you may have button mashy combat for most of the game, and suddenly you have no weapon, or a sudden stealth section. Which I think sets a difference from a more “actiony” game in that the game thinks removing your ability to fight is part of the challenge, versus a classic beat-em-up where you’re plowing through more hordes of enemies.